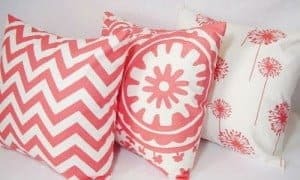 Measure the standard pillow case that you use in your house. It will give you an estimation of fabric which you will need. Remember to take in some extra fabric in mind such that the seams are also included. If it is a huge bed sheet then I would not worry much about wasting fabric too! I always feel smaller fabric works out to be easier to work with so I cut out rectangle shapes as per the size of the pillow case. Ironing the material would help you to get exact measurements. Maybe you could use a rotary cutter to cut the material out as per the precise size you need. You could pin the edges together, possibly leaving around three fourth of an inch from the edges. Use a thread and needle along with the back stitch and sew up three of the four sides. In fact a friend of mine actually used a no-sew fabric glue since she was miserable at sewing. The last step would involve turning the fabric inside out and put the pillow in it. The ‘unhemmed’ edge can be sewn up or stuck in accordance to the other sides.